STOUT BELL TENT with FRONTIER STOVE. We love the tent, but our needs have changed and we no longer use it. 13 FOOT (4 METER) BELL TENT. 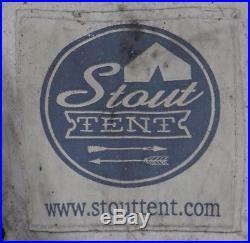 Original, high quality, Stout Bell tent. Zip in/out groundsheet, giving you the freedom to roll up the tent walls and enjoy maximum ventilation and cross breeze. Stove Jack, sized to meet industry standards and professionally installed to protect the integrity of your canvas. Stove jack is covered with a flap for when it is not in use. Pro-Metal Sliders to serve as tensioners on your guy-lines. Made to last, won’t snap or deteriorate from harsh UV rays like typical plastic sliders. Highest quality mesh screen door and (4) windows let you open the tent for a breeze or a view without worrying about bugs or critters. Bug Guard Wall for an extended mesh inner wall along the entire bottom wall of the tent. No Sweat Canvas: Keeps water and condensation out. (The last time we used the tent it was raining and the inside stayed dry). Stout Stitch Reinforcement: Pressure points have 2-3 layers of canvas, and double-stitch reinforcement making it indestructible. Weather Ready: Toggle stove fly up, or Velcro close. Zipper-Ease Groundsheet: Military grade zippers. Won’t rust or stick. Bug Guard System: Screened doors, vents and windows. Signature Bug Guard double-wall design so that even when the sides are rolled up, no bugs get in. Quiet Night Design: The conical shape deflects winds, and leaves no place for rain or snow to gather. 100% natural, durable Cotton Canvas. (8.6-oz/285gsm), waterproof & mold resistant. Heavy duty PVC waterproof, zipped-in ground sheet (17.6-oz/596gsm). 3 Stove Jack adjustable up to 6, covered by 8 x 8 canvas cover with Velcro access. Entirely Double-stitch sewn, with stronger reinforcement of pressure points. More stitches per inch than other canvas tents. A 5 foot A-frame entrance creates a barrier from rain coming in through the door. Side-walls unzip from groundsheet and roll-up/toggled secured for breathability/cleaning. Canvas + Bug Guard Wall option. Additional bug netting protection (that can also roll up) after side-walls are unzipped and rolled up. Two easy protected passthroughs for power cords into the tent without affecting waterproofing/having to make holes. In addition to the natural water resistance that canvas offers, the tent has been treated with a well respected waterproofing process. You will see water bead up on the canvas, and you will stay dry even in the harshest weather. The tent also does well in the snow. The canvas has been lab tested and certified as compliant with CPAI-84, Californias stringent fireproof requirements. Wood burning stove o. Designed for the world of humanitarian aid, this little stove developed a cult following due to its clever engineering and robust design and has been heating up the camping world ever since. Lightweight and durable, the stove breaks down into a nicely-sized box when no longer in use and you can truly take them anywhere. Best of all, these are some of the safest stoves to cook on; the long flue makes sure to send those nasty gasses up and away from you, the cook. And because this isnt an open fire, its nearly 10 times as fuel efficient. Carrying Bag (zipper is broken). Bell tent, Outdoor, Shed, Tipi, Yurt. The item “13 ft. (4m) Stout Bell Tent (Ultimate Series) with Frontier Stove and Heat Mat” is in sale since Wednesday, December 5, 2018. This item is in the category “Sporting Goods\Outdoor Sports\Camping & Hiking\Tents & Canopies\Tents”. The seller is “subvinyl_records_and_books” and is located in San Leandro, California. This item can be shipped to United States.